Mark K. Weiss, builder, developer, and founder of Weiss & Associates, LLC, located in Wayne, PA has the power to see what most of us cannot. For the past 20 years, his eye for real estate has set him apart in experience, while his roots in the Main Line have given him a style uniquely Philadelphian. After building nearly 500 homes and developing more than 1,000 lots, this Radnor native now brings his talents to Philadelphia magazine’s Design Home 2017. Have you always wanted to become a builder? In college, I narrowed it down to lawyer, filmmaker or builder. I ultimately decided builder because I felt it was a great blend of art and business. Building and filmmaking are very similar—both are rooted in creativity and both require production that takes many professionals to achieve the final vision. Both are expansive processes with infinite possibilities. That’s really my inspiration for home-building…the infinite possibilities. How do you approach your projects creatively? I look at [building] as a complicated art medium (the most complicated if you ask me) because there are technical aspects as well as creative aspects. In the end, I view my homes as art that you live in. I want the homes I create to be stylish, comfortable and functional. What inspired your choice for the location of the Design Home 2017? I wanted Design Home 2017 to be located in a magical setting in the heart of the Main Line. I found a perfect spot on a private street at the end of cul-de-sac—it’s really a fairy-tale setting. What inspired your architectural approach? 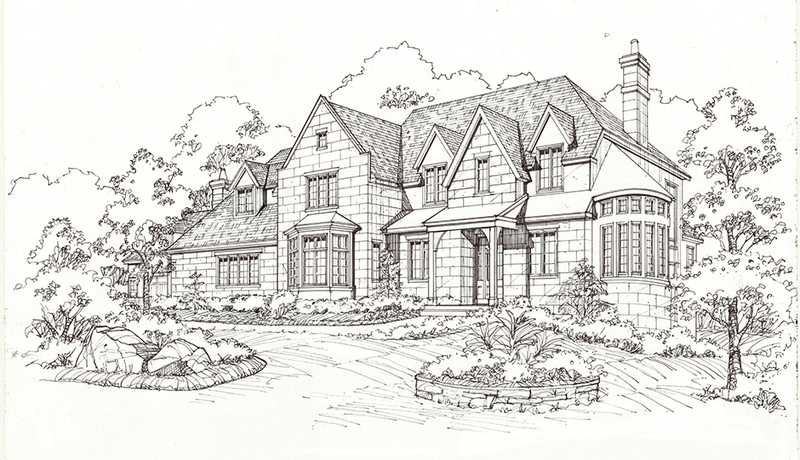 Every home should have a distinct architectural theme that fits into its context and streetscape. I wanted to embrace the rich architectural heritage of Old Wynnewood but infuse it with modern touches for a totally fresh look. Design Home 2017 was inspired by its setting and relationship to other adjacent houses. I would say English Norman is the style with elements like steep roof pitches, rounded conservatories, and prominent chimneys. What vision did you have in mind for the floor plan? Previously unused or neglected spaces have been repurposed and new spaces have been reimagined. I did away with living rooms, breakfast “nooks”, master sitting rooms, oversized foyers, wasteful volume ceiling spaces and traded them in for more useful spaces like an outdoor room, entertaining bar, inglenook, dressing rooms, walk-in closets, guest quarters, etc. I wanted the floor plan open and spacious, comfortable for entertaining while maintaining a cozy scale. I wanted to avoid cavernous rooms, being careful not to design them too small and lose the sense of a generous room. What vision did you have in mind for the interior design? I sought to blend English Norman architecture with the newest trends in finishes that are sleek and smooth… glass, stainless steel and limestone stone, for example. I wanted natural colors of wood, chocolate brown, black, and cream to work together to create sophistication reminiscent of 5th Avenue. What was your first step when approached with the project? It’s multi-faceted; you have to consider the setting, the site, the floor plan and finishes all at the same time. What design trends are you most excited to bring to Design Home 2017? In addition to architectural style and floor plan trends, I am very excited about the finishes. Design Home has been such a wonderful opportunity to bring together the best designers, manufacturers, suppliers and tradesmen. I think the combined effort will showcase the latest in design trends and will make Design Home 2017 something very special. Is there anything new you’re bringing to Design Home 2017 that you didn’t in previous projects? Virtually everything about Design Home represents a departure from the past. It’s an unbelievable collection and collaboration. Philadelphia magazine really deserves a lot of credit for inspiring this creative effort. SPONSOR CONTENT	‘Tis the Season for Delicious Eats!